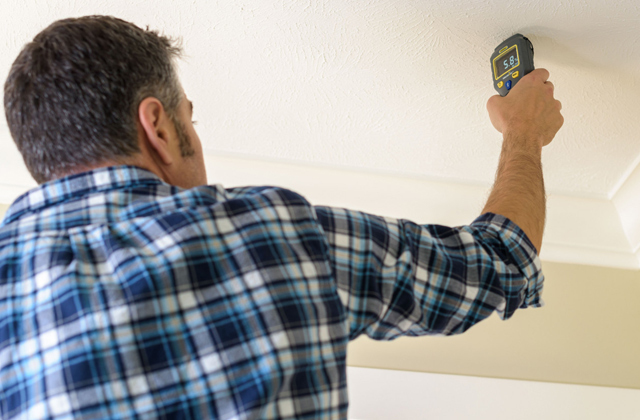 The AOS sensor provides accurate measurements even when the scale has water, oil or dirt stains on it. 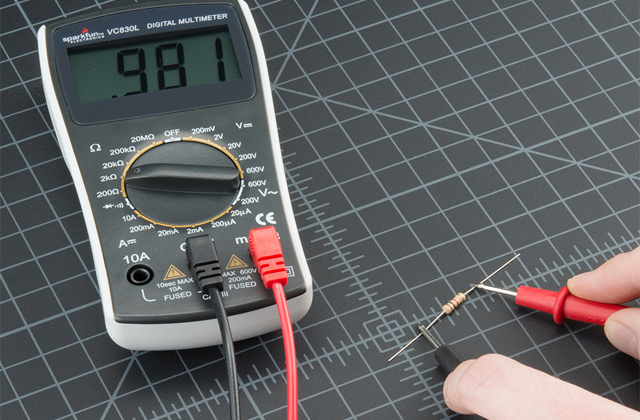 A measurement error may occur when the battery runs low. The Mitutoyo 500-196-30 digital caliper is irreplaceable for projects involving lathes or CNC machines where the use of oil and other fluids is typical. A great pick for a small production facility. The electroplating with its hard shell is rust- and acid-proof. It has excellent anti-alkali properties. The laser engravings make values clear, durable, and easy to read. Only the first couple of numerals are displayed in an upper case. OKPOW F-19 is one of the better digital calipers out there and probably the best model on our list. Its accuracy and precision are a given but just how convenient and practical this measuring tool is is something that definitely deserves some recognition. The machine-grooved thumb-roll mechanism allows the caliper to easily glide and ensures smooth sliding. This way, it is able to help with fine adjustment. The locking screw makes accurate position-setting a simple enough task. The batteries that come with the model are passable at best. J-Bonest GD00017 is an excellent digital caliper for a wide range of industrial and automotive applications. Though it does not cost a whole lot, the model is tough, practical, and functional enough to satisfy the most experienced and demanding customers. 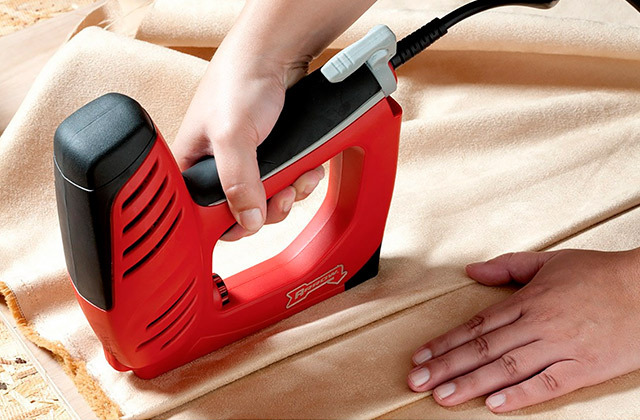 The IP54 class protection makes the tool water-, dust-, and oil-resistant. The hardened stainless steel shaft is not susceptible to rust or corrosion. It takes the tool between a year and 3 years to burn through a single battery. The wheel feels a little wobbly. TURATA A123 is a quality tool that boasts a solid build and a smooth operation. The controls are particularly convenient. 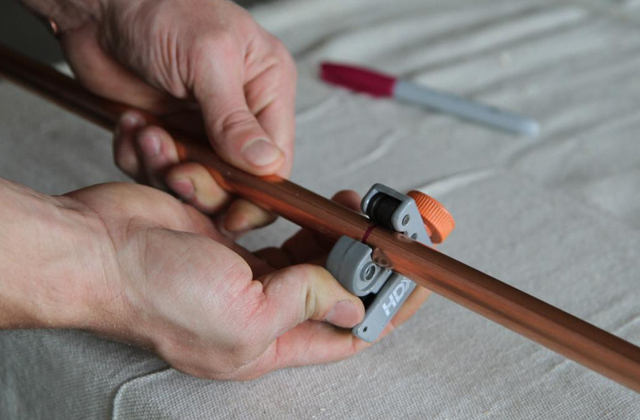 You can lock-in the necessary size using a little clamp, make fine adjustments with a thumbscrew, zero the gauge at the width, and take all sorts of measurements. With a resolution accuracy of 0.01mm (0.0005"), this digital caliper will allow you to measure the tiniest metal pieces. The contrast is high enough to be easily read under direct sunlight. The lightweight construction prevents hand shaking. Doesn't include a protective case. TACKLIFE DC01 is fairly impressive. It is great for people who often work outside and even better for those who have poor eyesight. 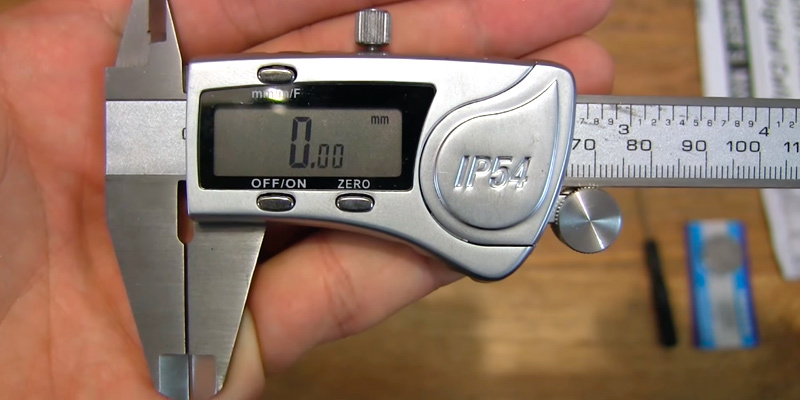 A good digital caliper for small-time mechanics and aspiring handymen. With it, you won't have to rely on guesstimating and the eyeball approach. 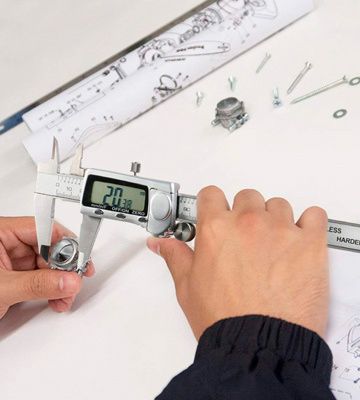 When examining this Mitutoyo digital caliper, we were aware it was a Japan-produced caliper and we wanted to find out if this model would meet the high-quality standards of the tools made in Japan. The first experience was positive as Mitutoyo 500-196-30 comes in a sturdy plastic case that reliably protects the tool when stored. Inside the box, we also found the battery, manual, warranty certificate and calibration certificate with a serial number that confirms that the tool has undergone a check-up and precise calibration. The model is made of stainless steel and can be used with fluid-covered parts but we will touch this aspect later. The jaws have laser machined surfaces and thus provide super accurate measurements due to the precision of their finish. 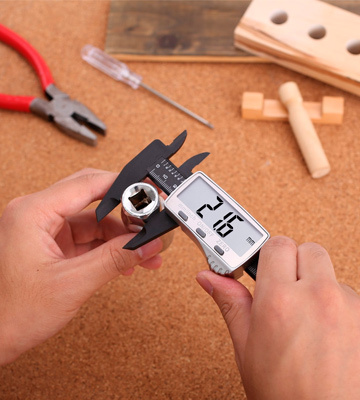 By the way, this caliper is able to measure both external and internal diameter, as well as the depth. All the tool components are dovetailed with each other, thus we did not find any backlashes or axial floats while performing measurements. 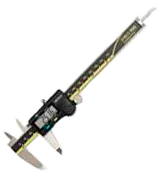 Regarding the measurement specification, this 6" ranged electronic caliper is able to take measurements in millimeters and inches. The scale resolution is 0.0005" and the accuracy is up to 0.001". 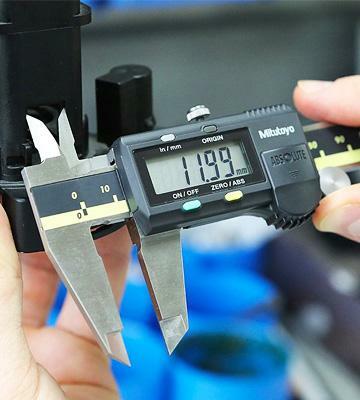 These ratings allow using the tool for measuring parts with the precision of one-hundredth of an inch, so the model can replace you a micrometer. 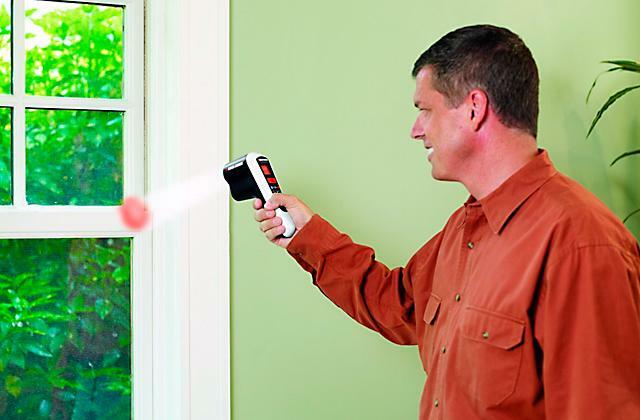 However, most of all we appreciated the advanced onsite sensor as it provides correct readings even when it is stained with water, oil or dirt. This component considerably expands the tool applicability area and allows using it in rainy weather and at metal processing facilities, which employ coolants and oils. The tests showed that the sensor functions well when switching between different part sizes rapidly and delivers a correct measurement at the zero point. The only shortcoming of the caliper we found was the incorrect readings when the battery is depleted to 1.2V, so keep an eye on the battery charge and replace it in time. 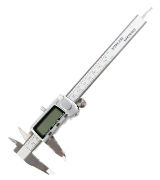 We'd like to highlight a convenient arrangement of controls of this digital caliper. The ZERO/ABS and ORIGIN buttons are located close to your thumb, which allows quickly adjusting the tool up. Also, you can use the button above the LCD display that switches the mode of displaying the measurement results between inch and millimeter values. Hence, you'll be able to measure parts in different metrics and check the readings against different documents and specifications. Additionally, we'd like to point out a smooth run and high sensitivity of the thumbscrew that ensure high-accuracy measurements. 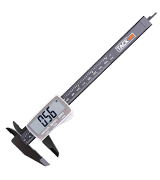 OKPOW F-19 is a digital vernier caliper that prides itself on its accuracy and precision. And, for the most part, it has every right to be proud. Its measurement accuracy of ±0.001"/0.02mm and a measurement range of 0-6 inches/150mm are nothing to scoff at. But we don't like the model for its accuracy. We like it for all of the extra features that it packs on top of the accuracy. We like the electroplating, with its hard shell that is rust- and acid-proof as well as its anti-alkali properties. We like the laser engravings that make values clear, durable, and easy to read. We certainly do not dislike the handy conversation chart at the back of the device. But, most importantly, we like this digital caliper for its practicality. More specifically, how it allows you to switch between metric(mm), imperial(inch), and fractions conversion. An approach like that makes measuring a lot faster than the two-way conversion method. Sure, it isn't flawless. Though we did praise the engraving earlier, only the first couple of numerals are displayed in an upper case, so it isn't as easy to read all of them as it could've been if the people behind the product made sure to add every numeral in an upper case. But even despite that, OKPOW F-19 is still one of the better digital calipers out there and probably the best model on our list. Its accuracy and precision are a given but just how convenient and practical the device is is something that definitely deserves our recognition. 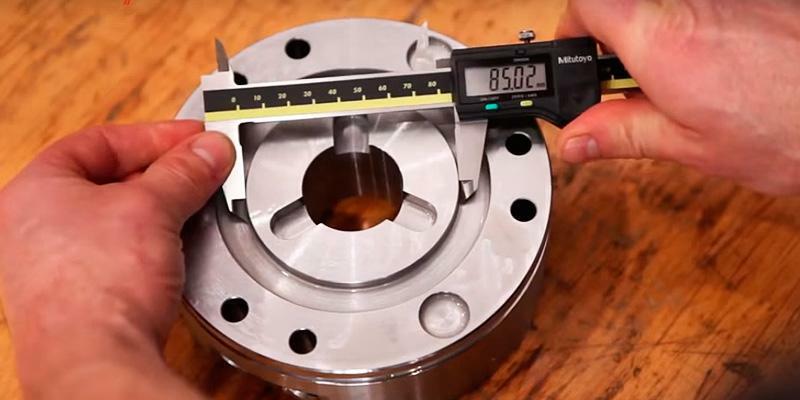 The people behind these measuring tools often try to make them as tough and durable as possible but the ones in charge of J-Bonest GD00017 have taken that philosophy to another level. The hardened steel construction in and of itself is no joke, we can tell you that much. 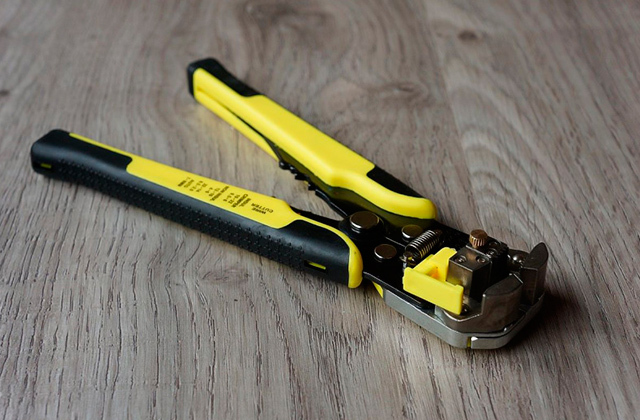 The machine-grooved thumb-roll mechanism is just as much about adding durability points as it is about making the tool more practical and functional. It is the part that allows the caliper to easily glide and the part that ensures smooth sliding. This way, it is able to help with fine adjustment. The extra-large screen that adds up to 0.52 to 1.22 inches in height and width makes the reading clear and large enough to read. As per usual, you'll find a conversation chart at the back of the tool. The millimetre-to-inch conversion and a zero setting are available at any point. 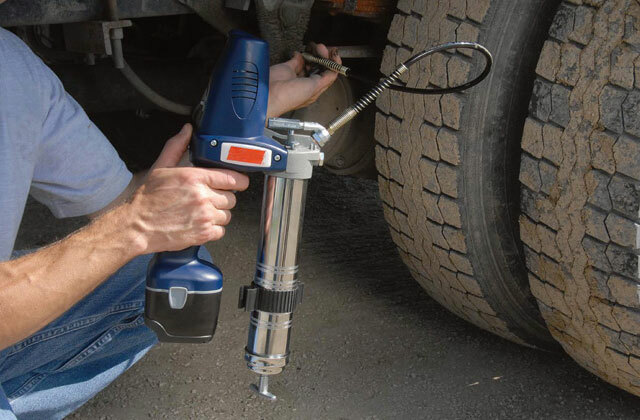 The locking screw makes accurate position-setting a simple enough task. It will let you just as easily and accurately measure internal, external, and height dimensions. The only area where the product in question disappoints is the batteries that come with it. Passable at best, these batteries die relatively quickly but you can always purchase a couple of new ones at the nearest corner store. Bottom line, J-Bonest GD00017 is an excellent digital caliper for a wide range of industrial and automotive applications. Though it does not cost a whole lot, the model is tough, practical, and functional enough to satisfy the most experienced and demanding customers. TURATA A123 is mostly everything people have come to expect out of high-quality professional measuring tools. First and foremost, this caliper is as accurate as the rest of them. With a resolution accuracy of 0.01mm (0.0005"), it will allow you to measure the tiniest metal pieces. The hardened stainless steel shaft is not susceptible to rust and corrosion. Plus, it is sturdy enough to withstand serious daily use. But before we wrap up the caliper itself, let's talk a little about what comes with it. First, there's a protective case that helps with both storage and transportation. Second, the company sends you two batteries, one for the caliper and one spare. 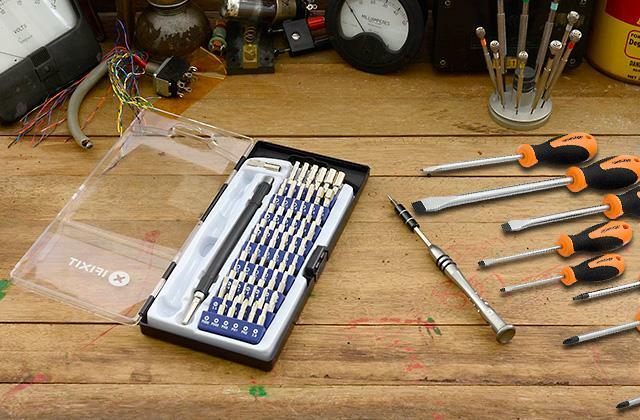 On top of that, the package includes a screwdriver. All of these extra accessories are a really nice touch considering the modest price tag but we especially like the batteries. Mostly because it takes this digital caliper somewhere between a year and 3 years to burn through a single battery, so you will hardly need to replace them in the foreseeable future. But, back to the tool, almost every part of it is up to par and there's very little worth mentioning for those who have some experience with these devices. The wheel feels a little wobbly but nothing to be too concerned about. The display is large, the auto-shutoff function is there, and so is the IP54 class protection. To put it all a little differently, TURATA A123 is a quality tool that boasts a solid build and a smooth operation. The controls are particularly convenient. You can lock-in the necessary size using a little clamp, make fine adjustments with a thumbscrew, zero the gauge at the width, etc. TACKLIFE DC01 might just be the weakest link in this review. But keep in mind that even the worst model here is better than the absolute majority of calipers out there. Plus, it's not like this is a bad product. Strictly as a caliper, it does not disappoint whatsoever. Its accuracy of ±0.02mm (±0.001”), the 0.01mm (0.0005") resolution, and a measurement range that goes from 0 to 150 mm (0 to 6") are up there with the best of them. Just that the whole package is not as impressive as it could be. All you get is a caliper and one battery, an unfortunate change of pace from the usual deal where you often receive an extra spare battery, a screwdriver, and a protective case. We don't really care for the extra battery and the screwdriver (who doesn't have a screwdriver?) but the absence of the case is a relatively serious mistake in our book. Though, to be fair, it's not like the company is just being greedy. 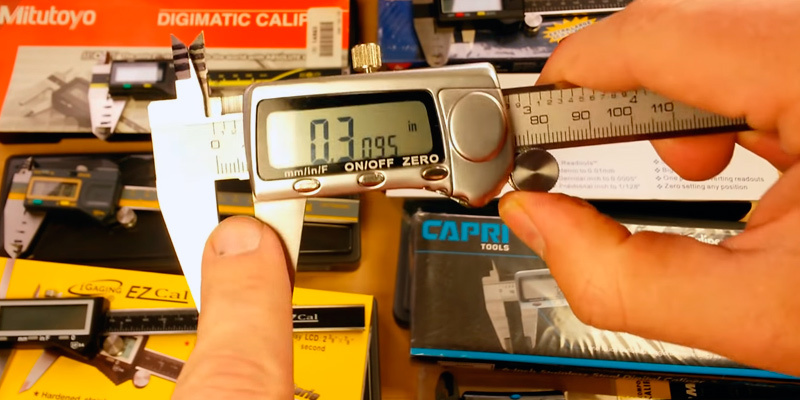 Your average digital caliper that includes these extra accessories usually costs at least 15 quid, while the model in question goes for less than 9. And, to make up for it, the manufacturers have added a large LCD screen with sizable values and a contrast high enough to be easily read under direct sunlight. Plus, the lightweight construction practically removes deviation that comes from shaky hands out of the equation. All in all, for a budget model, TACKLIFE DC01 is fairly impressive. It is great for people who often work outside and even better for those who have poor eyesight. 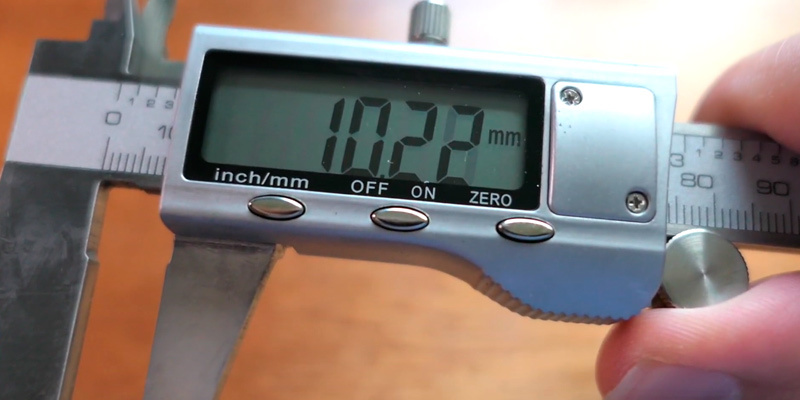 A good digital caliper for small-time mechanics and aspiring handymen. With it, you won't have to rely on guesstimating and the eyeball approach. People who perform automobile repairs or dabble in metalworking from time to time often find themselves in situations when accurate measurements of some parts are a requirement or a straight-up necessity. But a good ol' trusty ruler just isn't accurate enough. So, a grist of measuring devices was designed with lots of them dedicated to gaging a depth, thickness or length. 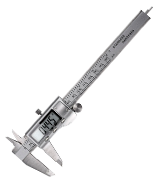 We'd like to provide you with some useful info on digital calipers, which are able to measure several parameters with high accuracy. 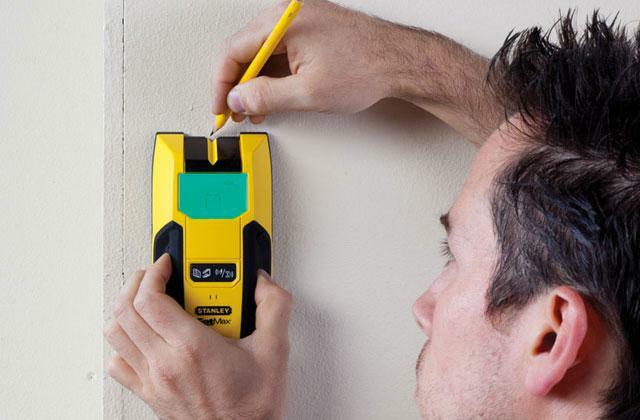 An electronic caliper proves useful in a joiner's shop as well as in a turner's toolbox. This review covers different caliper models, among which you can find the one that suits you best. 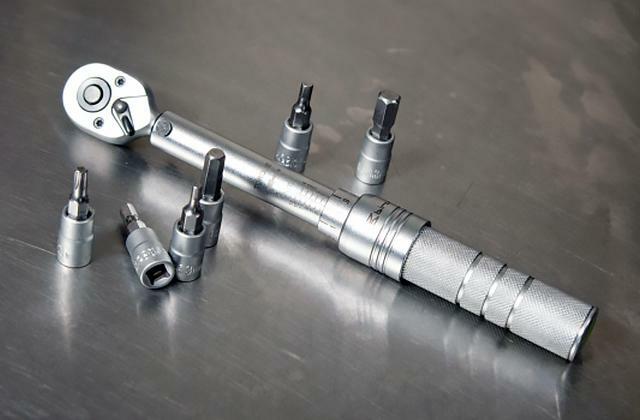 If you are selecting tools for your home shed, take a look at our electric screwdrivers and screwdriver sets reviews to pick one of the torque wrenches essential for repairing cars, motorcycles, and gardening tools. Choosing a caliper, we recommend you to concentrate on some aspects that will help you pick an appropriate tool. 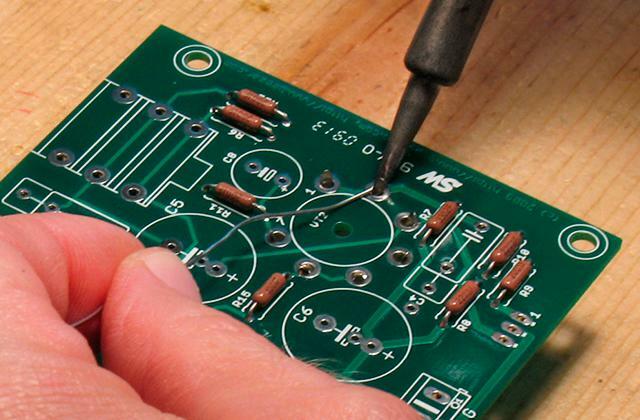 For a start, you need to determine the size of parts you're going to measure. 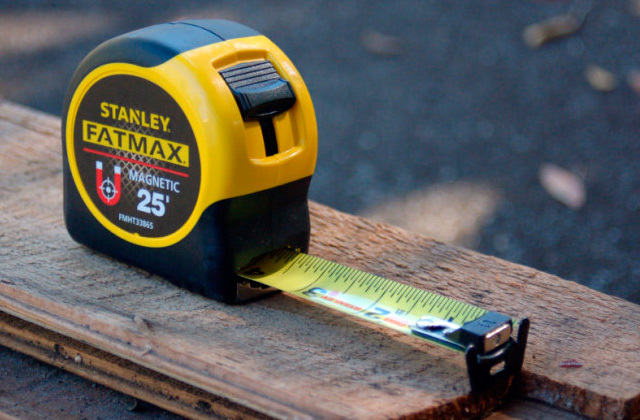 If these parts make up to 3"-5" in size, opt for a digital caliper with a 6" measurement range. Such model is handy and easy to use and store. A 8" or 12" long caliper fits better for thicker and bigger items. However, keep in mind that the bigger the caliper, the less comfortable it is to use, particularly when measuring chucked pieces. 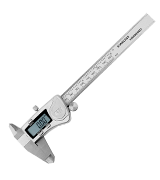 Choosing a caliper, consider also its resolution and measurement accuracy. 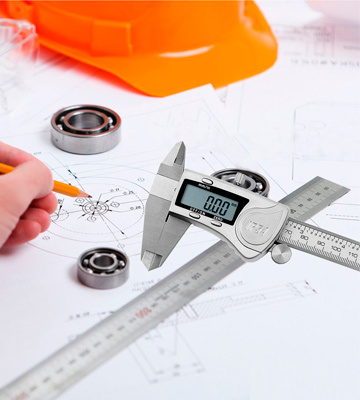 If you need to measure metal pieces, it is preferable to choose a caliper with resolution (also called a scale division or increment) of no more than 0.0005" and accuracy of up to 0.001". Though, this accuracy is usually excessive for measuring woodwork as timber may expand in high humidity conditions. Therefore, a caliper with a basic resolution and accuracy is enough for measuring wood pieces. Such calipers are more affordable and are available in many models and options. The functions of the digital caliper are the next point worth your consideration. 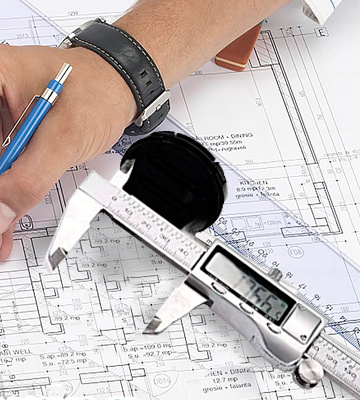 Most contemporary models are capable of taking metric and inch measurements and display fractions often found in engineering documentation. Thus, if you don't want to spend a lot of time converting metrics, consider buying one of such calipers. 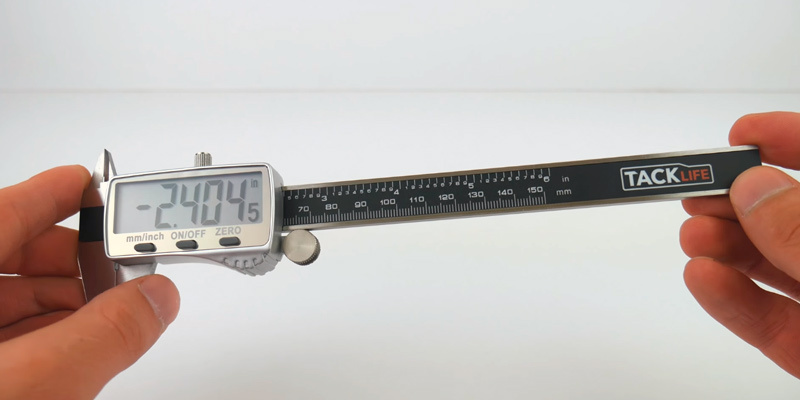 If you are looking for а device to measure numerous items frequently and need to record the measurements, it will be practical to look for caliper models that allow a wired or wireless connection to a PC. They help drawing reports on digital measurements and considerably reduce the reporting time. The auto-off function is also useful as it extends the battery life and turns a caliper off automatically when not in use. Finally, you need to identify the environment and conditions your caliper is to be used in. The using environment defines the choice of materials for the caliper and whether it needs water, dirt or oil protection. The best option is a stainless steel model, which is resistant to corrosion and withstands adverse conditions. If you're going to measure CNC or lathe machined/produced parts, pick a model that is resistant to oil. If plan to use the caliper outdoors, the best way is to go for models with IP54 and a better class of protection. Following these simple recommendations, you'll easily pick a caliper according to your needs. 1. 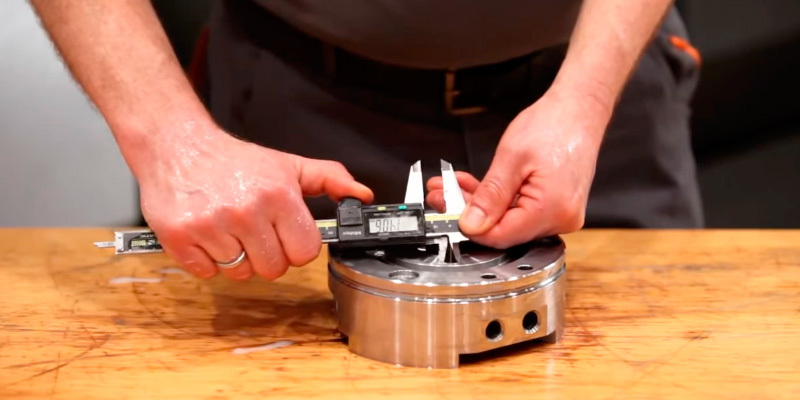 Owen Smithyman How to Use Your Digital Calipers: 7 Tips, Make:. November 13, 2015. 2. Calipers Buying Guide, eBay. March 3, 2016. 3. How to Use an Electronic Digital Caliper, wikiHow. 4. 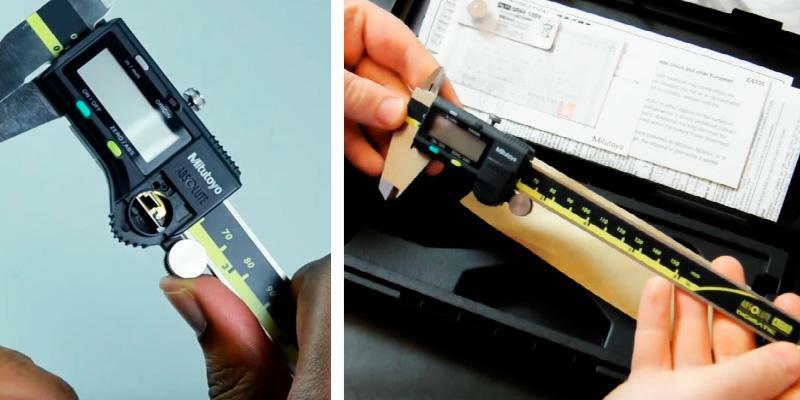 6 Tips for Using a Digital Caliper, DoItYourself. 5. Calipers, Wikipedia. January 16, 2017. 6. J.T. Barett How Do Digital Calipers Work? eHow. 7. Digital vs. Dial Calipers, Adafruit Industries. 8. How does an electronic caliper work? Electrical Engineering Stack.